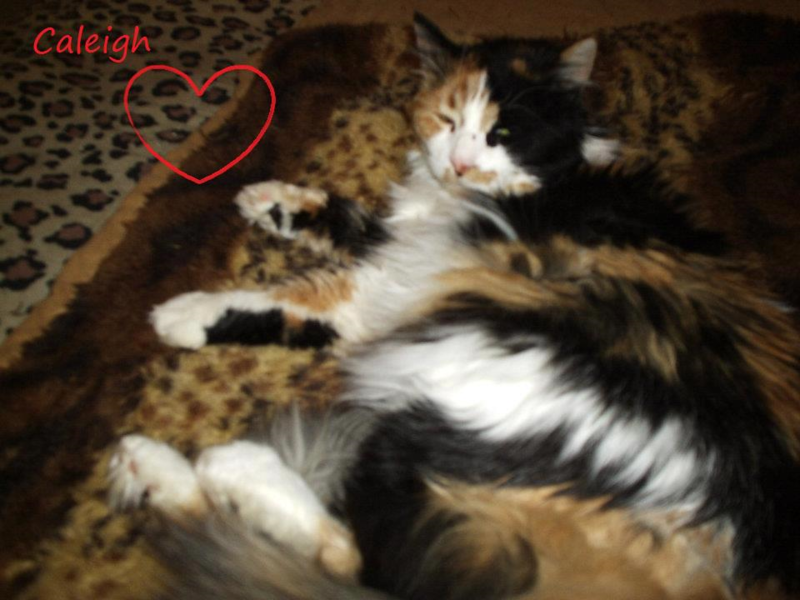 Caleigh is a beautiful long-hair Calico who was rescued by Feral Paws Rescue from a kill-shelter in Los Angeles County in late 2011. 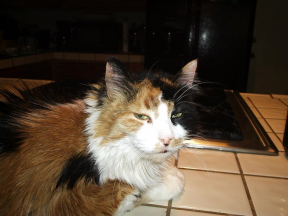 She was brought to the main rescue in Fresno, and in early February 2012, Feral Paws Rescue received a call from a lady who was interested in their Rescue and wanted another cat to add to her existing family of a handful of mostly black cats. Feral Paws Rescue brought Caleigh over to the lady’s house, and it was love at first sight. At the time, it was estimated that Caleigh was three years old. No other history was known about her, but she quickly assimilated herself to living indoors with other cats and most of all to her new human as she wanted to be with her and followed her all over the house. Caleigh’s favorite place is the bathroom sink where she often has to be removed from it in order to turn on the water! She also loves Thanksgiving turkey dinners and must check out her human’s food and take a few bites for herself. As Caleigh’s new human’s relationship with Feral Paws Rescue grew, so did the family of cats in the household, including kittens who came in for foster care until they got older. The kittens found a surrogate mother with Caleigh who would tend to them, bathe them, and let them sleep with her. Caleigh definitely had a motherly instinct, and her human often wondered if she ever had any babies of her own. Three kittens who Caleigh cared for were very special. They were barely two months old, all black, and had come out of the shelter with URI (Upper Respiratory Infection). Caleigh gave those kittens extra special attention and love. Over the years, there haven’t been as many kittens come into her human’s house as that first year, and now it is five years since Caleigh found her forever home. Her human guardian is forever grateful to Feral Paws Rescue for saving her and so many others from these kill-shelters and still provides foster care for the Rescue. And Caleigh loves all the kitties who come into the house no matter how long they stay! Saturday, March 18, from 11 a.m. to 4 p.m.